JET is a company which manufactures, imports and distributes a wide range of products. They needed a “brochure” to replace an existing 3-panel flyer that was out of date, and didn’t reflect the company as anything other than a distributor of off-shore product. After meeting with the executives who would be using the “piece” we decided to create an introductory piece or leave behind that would establish the credentials of JET in an immediate and clear manner, especially in situations where discussions would be taking place through interpreters. The “story” of JET Equipment & Tools and its various divisions was kept clear and simple, and was backed up with beauty shots of single products from each of the major product groups they dealt with. These pages were divided with journalistic-style shots which brought in the “capabilities” aspect of JET—its managing staff, its warehousing capabilities and its shipping contacts. 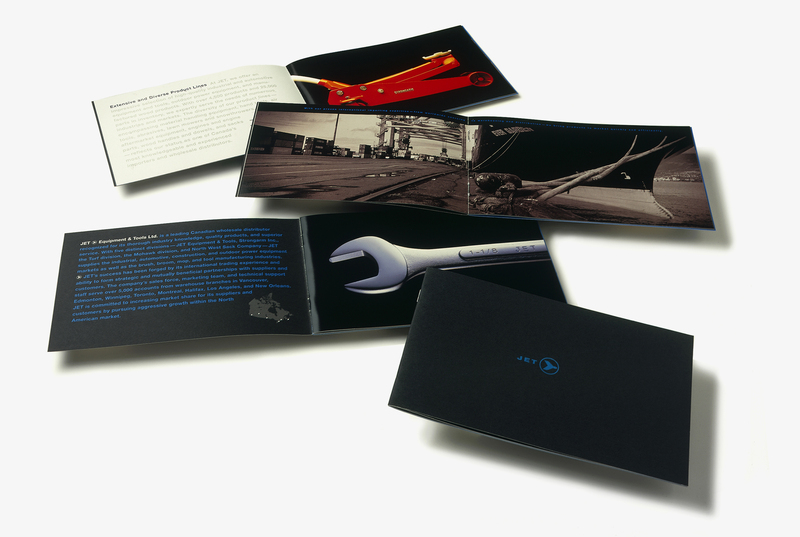 Throughout the development of the concept and the final piece, the feedback from the client was such that they were actually demonstrating to the design team in meetings how they anticipated using the booklet. The results have far exceeded expectations, and have landed them innumerable contracts and connections from firms who in the past would not take them seriously.